Disney Mania just hit the Medina household big time. Let’s just say, if you have stock in Disney, you can thank me and my 19-year-old daughter, Sarah, for the increase in value you saw last week. Yes, that was us, spending money hand over fist, as if we’d just received the inside scoop that the world was ending and the only way to save it was to go crazy in Disney World. Our “Lost Weekend” had nothing to do with alcohol, heroin or cocaine and had everything to do with our love for The Mouse. But I blame Disney. I also blame my parents who’d let me sit in front of the old black and white console, day after day, watching “The Mickey Mouse Show. “ Thanks to watching, “Mickey” and “Mouse” were the first words I learned to spell—and this was way before “Sesame Street.” Who can forget the immortal words from the show’s poignant closing song, which would bring tears to my eyes every time? I’d sob when the show was over and no assurances that it would be back again the following day could stop my wailing. I needed my Mickey fix and I needed it NOW! So Sarah and I went on vacation to Walt Disney World in Orlando, Florida. Our first visit and I’m here to tell you that the folks at Disney sure know how to pull out all the stops. They work feverishly to take the “hassle” out of vacations by seeing to your every whim so that you love it so much you want to come back even before you leave. For six days we never forgot for one moment that we were in the land of Mickey. The indoctrination began at the Orlando International Airport which, if you ask me, should be renamed Disney International. From the moment we arrived the Disney staff, I mean cast members, went into hyper-drive to ensure we had a very Disney experience. 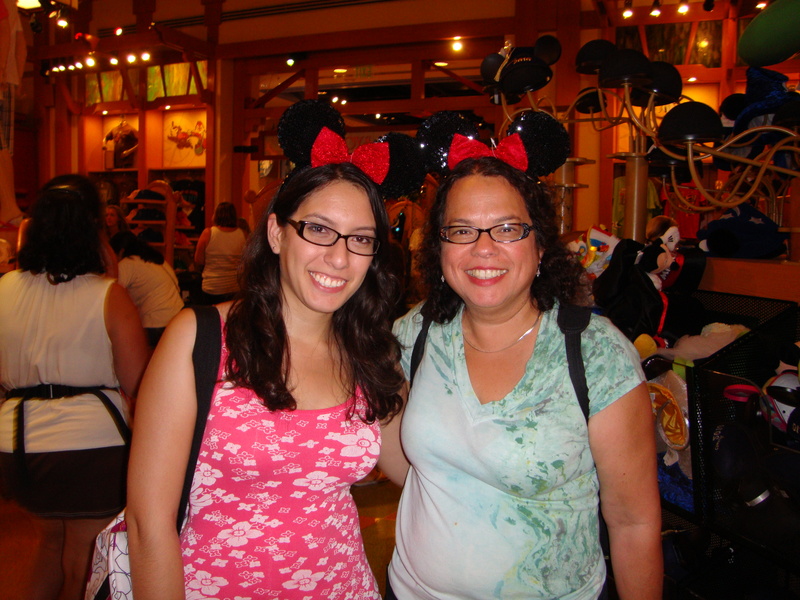 We were picked up from the airport by Disney’s Magical Express and whisked to our Disney resort. The magical fun begins on this bus! No need to wait for luggage at baggage claim! Disney dealt with that trivial matter and delivered our suitcases straight to our room. At check-in we were given a portfolio that contained all we needed for our stay: brochures and maps for each of the Disney theme parks, and a handy dandy key card that not only unlocked our hotel room door, it also contained all our passes to the theme parks, our Disney dining plan and my credit card information that could be used anywhere in Disney World. One tiny card packing a lot of punch! Still, my daughter and I were over the moon, ready to embrace it all. We wanted to find the hidden Mickey’s that we were told were secretly placed throughout the parks and resorts. We wanted to go on all the rides, and see the 3-D movies and shows. But mostly we wanted to shop. Some people wait until the end of their visit to shop for souvenirs. My daughter and I are of a different mindset and that’s why I love travelling with her. We say, why wait? Let’s shop now! 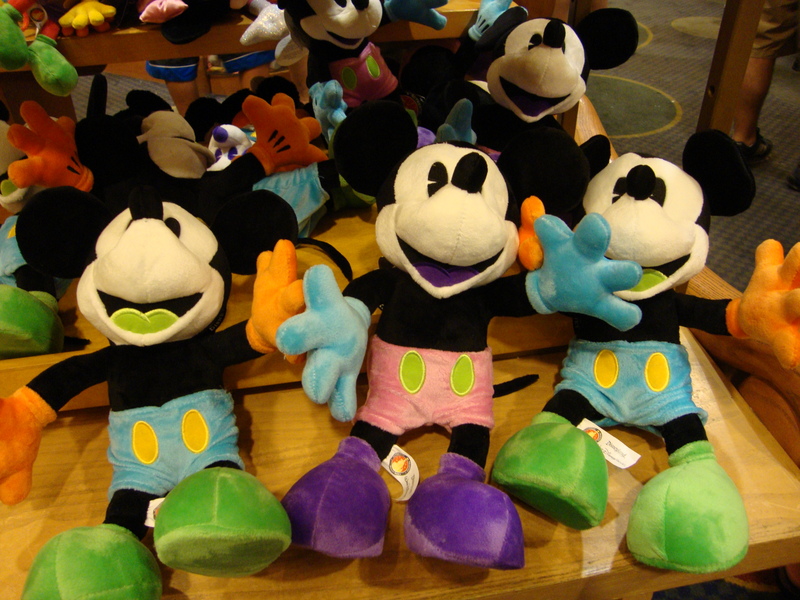 If the world ends we’ll be fully stocked in our Disney regalia—decked out from head to toe! My daughter and I having a Disney moment. Yes, we wore our devotion to Disney on our sleeves. And on our heads and feet. Minnie Mouse ears, Tinker Bell tees, Grumpy sweat pants and Mickey Mouse flip flops. It rained during our trip but that was no problem. We just put on our newly purchased Mickey Mouse ponchos and took out our Dumbo umbrellas, replacing our Minnie Mouse ears with Mickey Mouse baseball caps. Thank heavens for our Disney credit card! And we were not alone in our Disney fashion. As we walked through each of the theme parks, we noticed young and old dressed as their favorite Disney character–Cinderella, Jasmine, Woody, Belle and the Donald. Duck, that is. Decked out Disney fans meet Snow White. Nobody thought twice about the countless newlywed couples spending their honeymoons at Disney World, wearing their matching bride and groom Minnie and Mickey ears. Whether Republican or Democrat, Liberal or Tea Partier, whether Christian, Jew or Muslim, whether American or just visiting from abroad, we were all there for one reason: to experience the Mouse. There is no Red State or Blue State here. There is only the state of Disney and no one cared about the death-grip heat or the endless waiting on lines. Our end goal was far greater than the sum of these parts. Us Disneyphiles, we know who we are and any other time of year, we blend in with the rest of you. But at Disney World, we become Mickey and Minnie Mouse wannabees, or Cinderellas or Buzz Lightyears. You get the picture. So how about you? How do you feel about your Disney experience? I must say, I’ve never been one to don the mouse ears, or Goofy hats, but boy do I love those characters!!! !